Learn a simple recipe for a delicious breakfast parfait. An easy DIY recipe tutorial idea to get your day started off right. Kids love it too! This post has been compensated by Collective Bias, Inc. and its advertiser. All opinions are mine alone. Have you heard that saying, breakfast is the most important meal of the day? I’ve heard it my whole life. I don’t know about you, but when I first get up I don’t want to cook a huge meal. I was something quick and delicious. This Breakfast Parfait Recipe is perfect! It is very simple to make, even the kids can make their own, it is delicious, and is actually a great way to start the day! Serve with a spoon and breakfast is served! Like videos? I have a video tutorial for you too! Please subscribe to my YouTube Channel so you don’t miss out on any future video tutorials! I love the crunch that the cereal gives the parfait, and all of the flavors combined are super yummy. What is your favorite flavor of pie? Share and leave a comment below! What is your favorite simple breakfast recipe? Share and leave a comment below! SAVE HOW TO MAKE A BREAKFAST PARFAIT TO YOUR FAVORITE BREAKFAST RECIPES PINTEREST BOARD! Sounds so quick and easy! Perfect for those busy mornings! Thanks for sharing at Dishing It & Digging It! Thanks for stopping by Marilyn! I love your parties so it’s good to see you over here! Thanks Erin. My kids love that it is a simple breakfast and different from the usual cereal and milk. Plus they can make it on their own! BONUS! 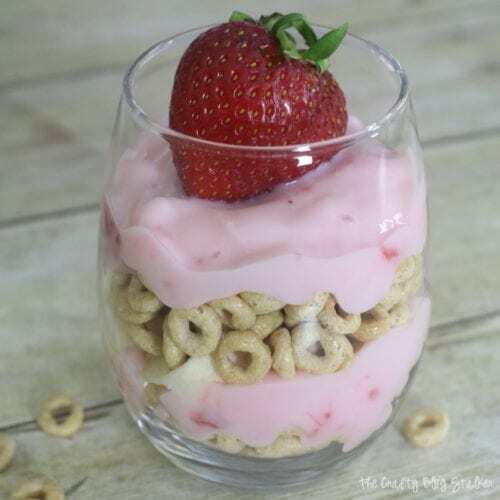 LOVE cheerios and parfait really do go good together!! Thank you so much for sharing at my craft party on Thursday! Would love to see your newest posts this week, which starts at 7pm EST. I love transforming simple ingredients into pretty presentations like this! Thank you, Ginger! I love layering because it almost always looks so pretty! My kiddos are going to love this! I have been working on having them help me make breakfast each morning and have been looking for something a little more fun and exciting than simple toast and yogurt. This is perfect! Thank you for sharing. You are welcome Lisa, I hope they love it! It is simple enough that kids can make and it is pretty tasty too! Aw, now this is my kind of breakfast parfait 🙂 Thanks for sharing this easy recipe with us! Pinned too. It is quite yummy! Thanks, Laurie.